Originally posted on the International Union for Conservation of Nature news page. Some may think ‘another conference’, yet I think what could be more important than water to gather a global community of engineers, scientists, policy-makers, heads of state and practitioners around? We all depend on water, there is no viable substitute. Despite many years in the job, I still consider myself privileged to be a part of that community and share in the mindset of finding solutions to the world’s most pressing water challenges. And ‘Sharing Water’ was the theme of the conference. Why? Because conflict over scarce water resources is and remains a real threat, whether locally or internationally. In fact, according to the CEO Water Mandate, water is connected to every major global risk the planet faces. And quite simply, as I remind my 4-year old regularly, sharing is caring. In my role as a communicator, that sharing involves knowledge and information. It did help that the World Water Forum, which took place from 18-23 March, coincided with World Water Day, celebrated each year on March 22nd and particularly focused on Nature-Based Solutions. A statement on World Water Day was released by IUCN’s Director-General highlighting nature’s potential as we face a mounting global water crisis. Good knowledge also requires the right channels to communicate through (see my previous blog) and working with the right partners to strengthen the message. And this is just what we did. 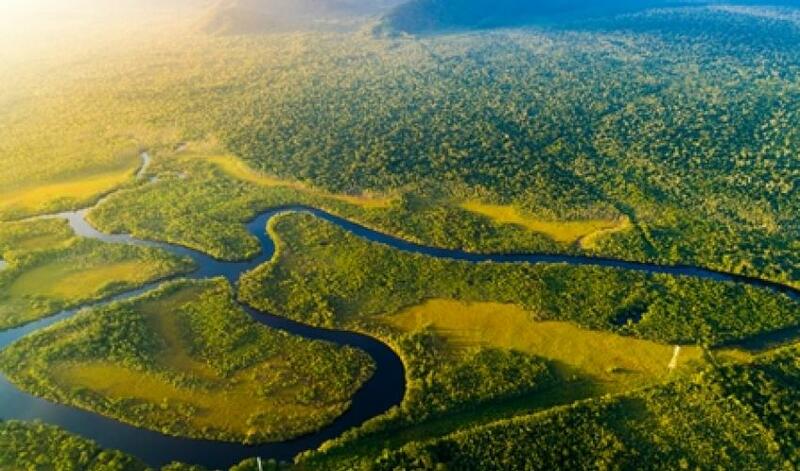 For the first time at a global water conference, IUCN joined forces with five environmental organisations to host a platform and showcase how nature can provide cost-effective, long-term water security to communities, cities and regions throughout the world. 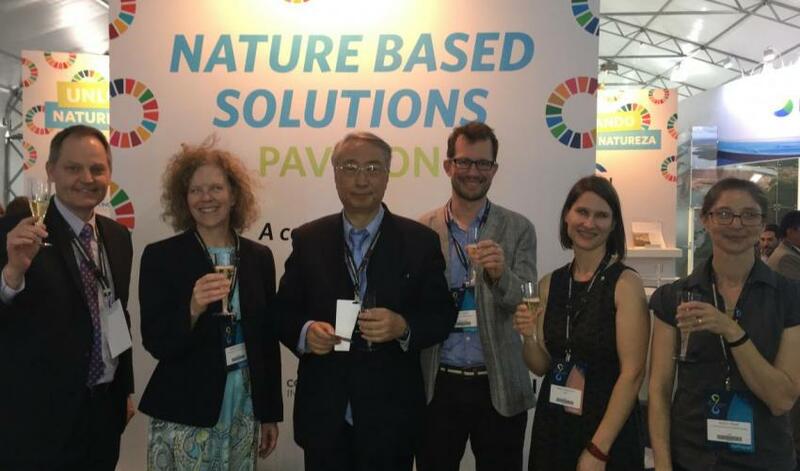 By working together with Conservation International, Wetlands International, The World Wildlife Fund, The Nature Conservancy and Forest Trends, we were able to boost the message of Nature-Based Solutions for water through a dedicated Nature-Based Solutions (NBS) pavilion. The consortium showcased examples, case studies, and projects of nature-based solutions that are securing water availability – and with it food, climate, health, human displacement, and biodiversity - around the world. Participants from over 172 countries attending the Forum were able to join in our sessions and interact directly with managers, scientists, experts, and project beneficiaries to learn from for example, the Cape Town water crisis or the Rio Doce Panel in Brazil, how to elevate the role of women in water governance, what the return on investment is from Water Funds, why there was cause for celebrating the world's largest wetland The Pantanal, or how to tap into change-makers to achieve transformative change (see new IUCN Publication ‘Champions of Change’), and much more. See the full programme of the NBS pavilion presentations here. In addition to a full-fledged series of pavilion events, we also launched a new animated video for our WISE-UP to Climateproject. Whilst the project work itself was already well captured in the UN’s World Water Development Report 2018 (WWDR) launched earlier that week, the new WISE-UP animated video illustrates how investing in natural infrastructure, such as restoring forests, re-vegetating river banks, protecting and managing natural floodplains, can optimise the performance of engineered infrastructure such as dams and reservoirs, whilst providing system-wide adaptation and local development benefits. Although I am under no illusion that the WISE-UP animated video will fare as jubilantly on YouTube as The Shape of Waterdid at the Oscars, I am a subscriber to #EarthOptimism and left the World Water Forum feeling optimistic about the future of water. A case in point is in the media. As we all know too well, bad news sells. Yet as in this Guardian article reporting on the WWDR launch in Brasilia, the title drew in with ‘Water shortages could affect 5bn people by 2050, UN report warns’. Quite sobering, and indeed worrying. But reading on, this gem of wisdom and optimism did sneak into the article: “the report says positive change is possible, particularly in the agricultural sector, but only if there is a move towards nature-based solutions that rely more on soil and trees than steel and concrete”. Perhaps if our minds also shift from doom and gloom to solutions and opportunities, that shift might just come about right on time. For more info, background and further updates, check our Twitter, Facebook and Events Page.